Julian Assange (Benedict Cumberbatch) started small. He ran a website, WikiLeaks, where whistleblowers could post leads that would eventually get posted. His first presentation was to a very small group of people at a hacker’s conference. Daniel Berg (Daniel Brühl) pulled some strings to get him to be able to speak at the conference. Daniel was intrigued, even enamored, by what Julian was doing. Julian was very cautious about who was allowed into his group. He didn’t trust anyone. After all, people’s lives, both their professional and their actual lives, were at stake here. Julian is a good judge of character, according to himself. He trusted Daniel, who excitedly joined the team. As things progressed, and WikiLeaks got more popular, Julian and Daniel upgraded their infrastructure and the submissions started pouring in. Both were obsessed with the cause. Daniel even took his obsession so far as to start to alienate his girlfriend, Anke (Alicia Vikander). The bigger WikiLeaks gets, the more Julian shows his true narcissistic side. He becomes more focused on himself, the recognition, and scooping everyone with his stories, and less about the free spreading of information. Things hit a boiling point when the Afghan War Files submission is received. Julian, Daniel, and the news organizations around the world who simultaneously publish the WikiLeaks stories must make a decision. A decision that could have severe global consequences. 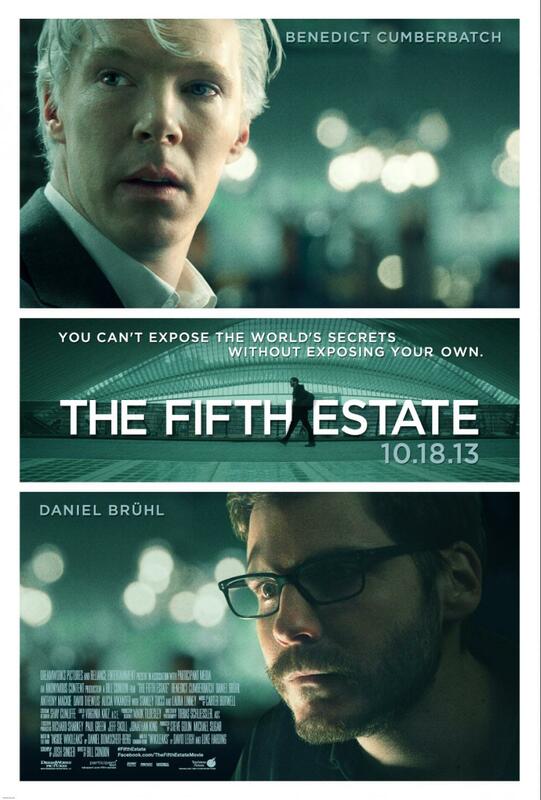 The Fifth Estate is based on actual events. For those who are planning to see this film to get more of the story about why WikiLeaks was so “bad” and why Julian Assange was being hunted (myself included), you will get a small glimpse into what was going on. In theory, the concept of WikiLeaks is a good idea. Once you put people in charge, you sully the process. The movie is an excruciating 2 hours and 8 minutes. And it feels every bit that long. Things move at a very slow pace. I realize it is difficult to create excitement and tension when everything is done in chatrooms, so no one overhears the conversations and everything can be encrypted. To try to overcome this hurdle, you get some really cheesy effects. Words that are being typed into the chat are projected in bright light across the actors faces as they are typing. Techno music is pounding in the background. None of it works. It comes off feeling like a 90’s wannabe espionage thriller. The biggest problem is that the story just isn’t that exciting. The are two types of people who will really enjoy this movie; those who, like Daniel Berg, are fascinated with Assange’s mission and think it is a noble cause or those who were just enthralled with the story in general. For the rest of us, it was a major disappointment. I found myself struggling to not only stay interested in the movie, but also to stay awake for the duration.